Well it’s been a big week for search, I think we can all agree. I won’t debate the merits of these improvements, we’ve done that already here: Google kills Right Hand Side Ads and here: Google launches Accelerated Mobile Pages, but there’s a definite feeling of vexation that appears to be coming to a head. As the paid search space increases in ‘top-heaviness’, as organic results get pushed further off the first SERP, as the Knowledge Graph scrapes more and more publisher content and continues to make it pointless to click through to a website, and as our longstanding feelings of unfairness over Google’s monopoly and tax balance become more acute, now more than ever we feel there should be another, viable search engine alternative. Bing also has a feature where if you type linkfromdomain:[site name] it will highlight the best ranked outgoing links from that site, helping you figure out which other sites your chosen site links to the most. Also note that Bing powers Yahoo’s search engine. The key feature of DuckDuckGo is that it doesn’t retain its users‘ data, so it won’t track you or manipulate results based on your behaviour. So if you’re particularly spooked by Google’s all-seeing, all-knowing eye, this might be the one for you. There’s lots more info on DuckDuckGo’s performance here. As Google gets better and better at answering more complicated questions, it will never be able to match the personal touch available with Quora. Ask any question and its erudite community will offer their replies. 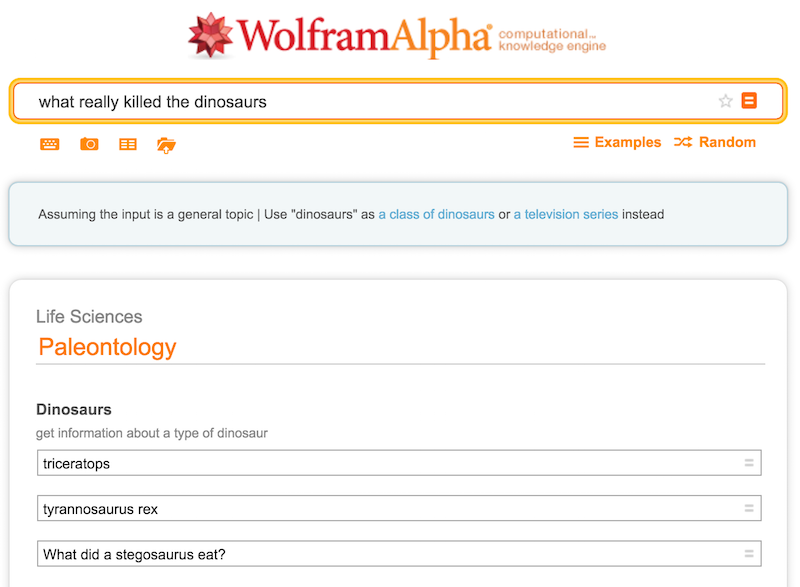 Or you can choose from any similar queries previously asked. 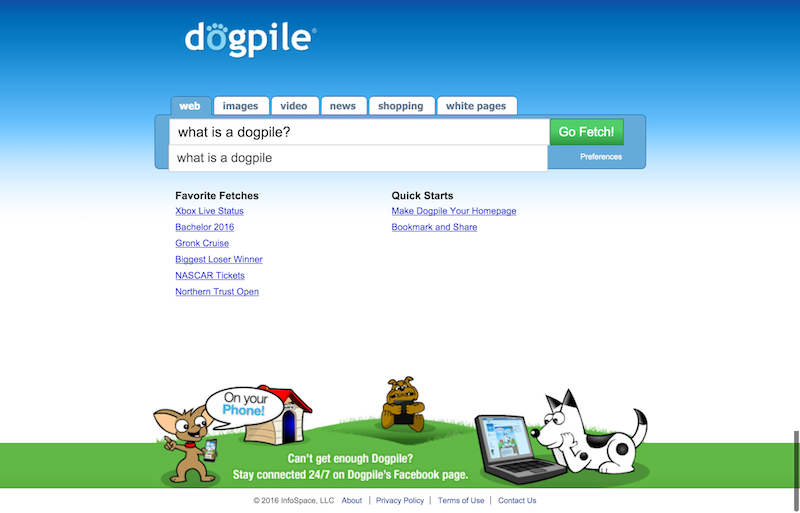 Dogpile may look like a search engine you cobbled together with clip-art, but that’s rather the point as it pulls in and ‘curates’ results from various different engines including Google, Yandex and Yahoo, but removes all the ads. Of course if you’re going to give up Google, then you’ll also have to give up YouTube, which can be a terrifying prospect. But there is an alternative. 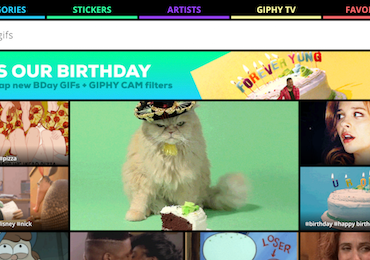 And a pretty good one at that… Vimeo. 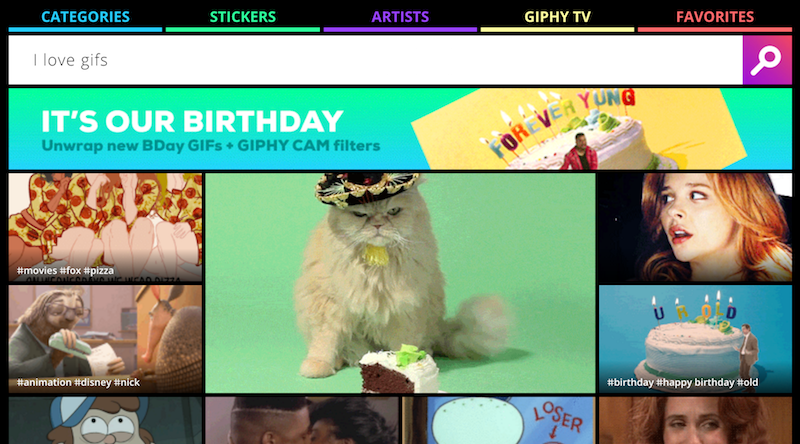 The professional’s choice of video-sharing site, which has lots of HD video and no ads. 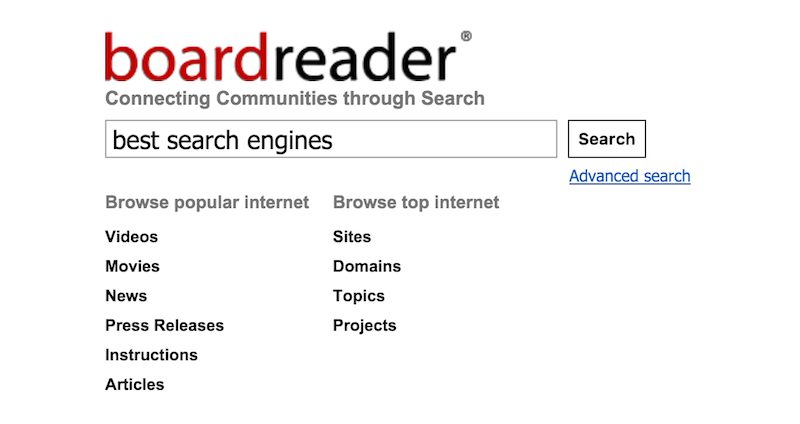 Another search engine that puts privacy at the forefront, StartPage (originally Ixquick) was the first search engine to allow its users to search privately. With StartPage, none of your details are stored (including your IP address) and no cookies are used, save for a single, anonymous cookie that’s used to remember your preferences. (For those who want to go “cookie-free”, StartPage has a URL generator alternative to save your settings). Uniquely, StartPage also offers a proxy for those who want to not just search, but browse, the web in full privacy. Oh look… Ask Jeeves is still around. Also he’s no longer a Wodehousian butler, but a computer generated bank manager. Weird. 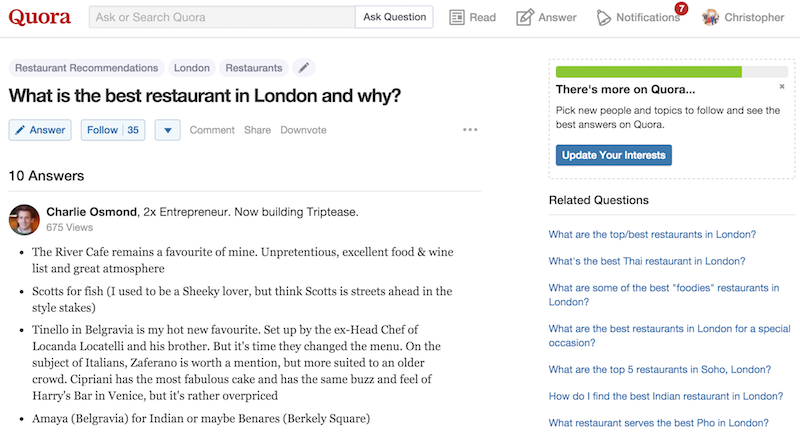 It’s still a slightly mediocre search engine pretending to be a question and answer site, but the ‘Popular Q&A’ results found on the right hand side are very handy if Jeeves himself can’t satisfy your query. And what a good use of the right-hand side space, huh Google. 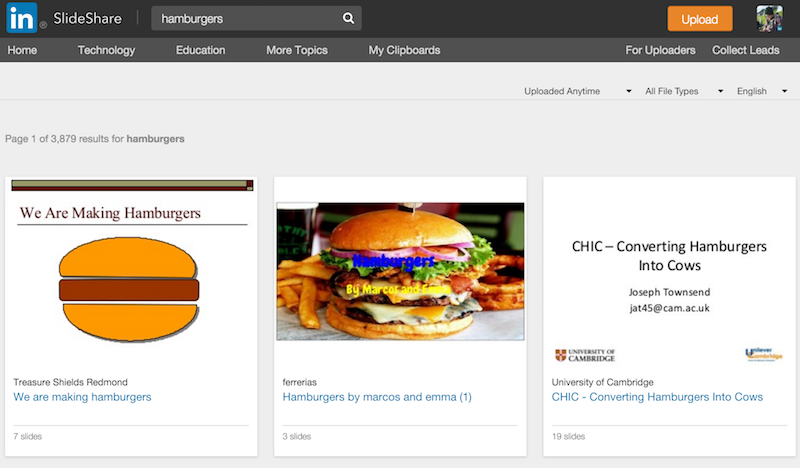 SlideShare is a really handy place to source information from presentations, slide decks, webinars and whatever else you may have missed from not attending a conference. You’ll also be surprised what information you can find there. “Inhale the web” with the friendly looking hoover guy by creating your own topic page, which you can bookmark and see results from a huge number of channels in that one page (including Google, Bing News, Twitter, YouTube, Flickr). 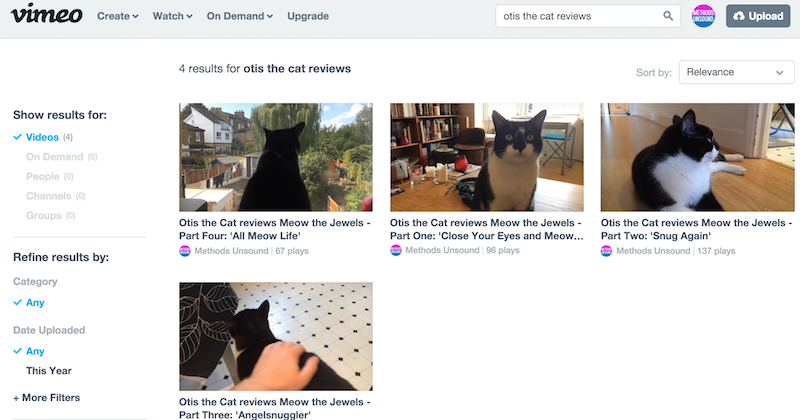 CC Search is particularly handy if you need to find copyright free images for your website (as discussed in this post on image optimisation for SEO). Just type your query in then click on your chosen site you want to search.